A vacation in Hawaii isn't cheap. The flight is expensive, the hotel is expensive, and the food is expensive ... but it doesn't have to be. There are many local restaurants and shops were you can get affordable, delicious food! Here are some of my suggestions for cheap (for Hawaii) food in Kauai, the Garden Island. The guide below is separated by neighborhoods, and there is something in each side of the island! In Hawaii, it's not about ramen - it's about saimin. Originally a Chinese noodle soup, the Hawaiian saimin receives influence from other cultures like Japan and Filipino. Hamura is a simple eatery that is popular with the locals, especially late at night - they're open until midnight on the weekends. 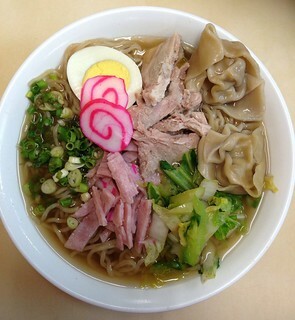 A small size of regular saimin is less than $6 or you can get the special saimin for $8, topped with wontons, boiled egg, roast pork, fish cakes, ham, and vegetables. Slurp away but save room for the lilikoi chiffon pie ($3.25 per slice). This little coffee shop is hidden in a nondescript office building off the main street in Lihue, but it's a great place to grab breakfast or some sandwiches for the road. They serve good coffee and even use coffee ice cubes for their iced coffee. Try their popular sandwiches like the chicken mac nut or wabi sabi (pictured, a tuna salad with wasabi sandwich topped with tomatotes and sprouts). A sandwich combo with chips, cookies, and a drink costs $9. A small market on the highway in Kapaa, a great place to stop and grab some lunch while driving to or from the north shore. 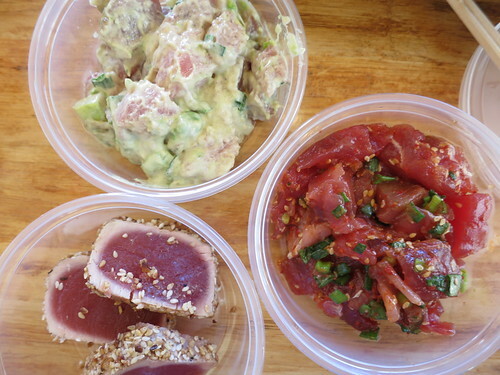 Pono Market serves a variety of poke dishes (by weight) along with lunch plates - specials change by the day but you can find Hawaiian specialties like pork or chicken lau lau, or Kalua pork. Lunch plates or poke bowls will cost around $10 depending on the item or how many item you get, and you won't be disappointed by the quality. The market also sells a variety of fresh manju. Al Pastor is a taco truck on the highway in Kapaa. 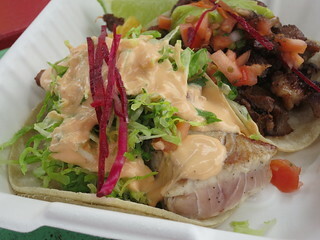 Other than the specialty al pastor taco, you should also try the fish taco - a thick slice of grilled ahi topped with fresh greens. Tacos are $4-4.50 but they are big and filled generously - two tacos will be enough for one person. You can also get a two-taco combo for $11 which also comes with rice and beans. On occasion, they might have a kalua pork taco. Java Kai is a great morning stop on my way up to the north shore for a dive, since they open early and have a good selection of coffee drinks (they roast their own coffee) and food. Though smoothies seem a bit expensive ($7.50-8.50), coffee drinks and juices are cheaper. 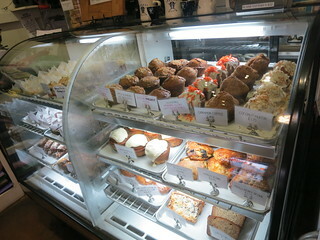 They also offer a variety of pastries, breakfast sandwiches ($9-11, comes with fruits), lunch sandwiches and wraps ($10-13, with salad or chips), and acai bowl. I'm actually doing a whole other shave ice post, but I wanted to throw this one in here. This shave ice place is tucked inside Hee Fat General Store, which sells shirts and other souvenirs, so you won't find it unless you know about it! 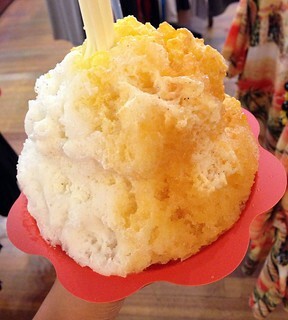 Their shave ice has a great fluffy texture and while the regular syrup is cheaper, you might want to consider splurging for the $5 shave ice which uses syrup made of real fruits! Yes, another fish market, another poke place. 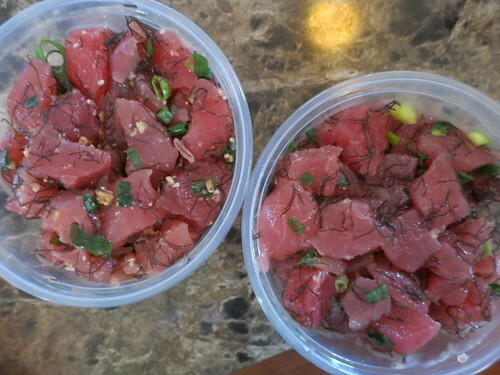 But not just any poke place, Koloa Fish Market arguable has the best poke on the island. Koloa Fish Market is a family-owned little shop started by Bert Matsuoka, who was previously the executive chef at the Sheraton hotel. He brings fine dining sensibilities to a local, traditional food. I tried avocado poke and Korean poke (with sesame oil and red chili) along with some excellent seared ahi tuna. Other than poke they also offer traditional lunch plates. A food truck serving comfort food like burgers, cheesesteaks, waffles, and sandwiches. 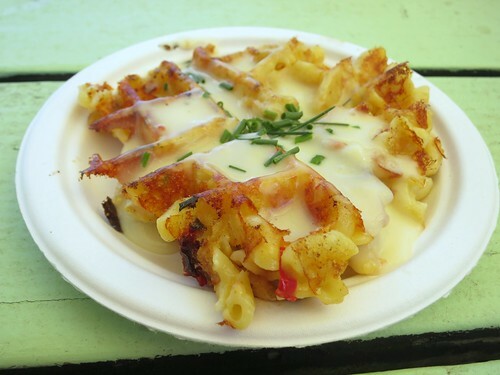 Food choices is diverse from the really heavy - you'll find items like waffled mac and cheese (yes, mac and cheese griddled in a waffle maker) - to lighter items like watermelon salad. They're in Lawai next to The Fresh Shave (see next listing) on Thursday and Friday afternoons and at Hanapepe art night on Friday nights. 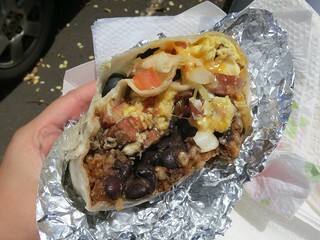 From a little window counter next to a market in Koloa is Da' Crack, a simple shop serving tacos and burritos. The burritos range about $9-11 depending on what you get - more expensive than Southern California prices, but the portions are generous and they'll fill you up. 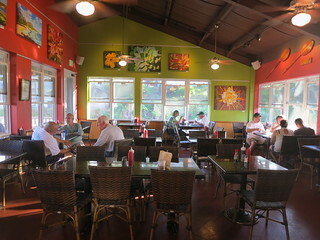 The cafe belonging to Kalaheo Coffee Company is pretty popular for take-out orders. They have a fairly large menu and serves food all day from breakfast to dinner. Scrambled breakfast sandwiches are pretty cheap and filling, but you can also sit down for some Belgian waffles and breakfast platter. They have a lot of vegetarian options as well, making this a good spot to go with a big group. Lunch calls for salads and sandwiches. Dinner here can be affordable or expensive depending on what you order: there are fresh catch of the day and prime ribs if you feel like splurging, or pastas and burgers if you don't want to spend too much. Hanalei has a lot of touristy spots and although the town also has some great local restaurants, many of them are on the expensive side. Instead, go casual for lunch and head to the Hanalei Taro & Juice Company truck. 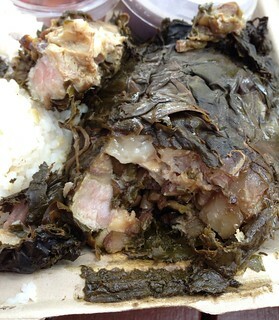 Hanalei has a taro plantation and naturally features the nutritious taro in their menu, with dishes like pork lau lau (pork wrapped and cooked in taro leaves) and the traditional poi. They also serve smoothies that are made with a taro base. 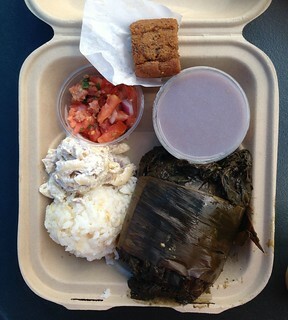 The lunch plate is about $10 and comes with poi or rice, lomi lomi salmon and a taro dessert. The smoothies are a bit expensive, but it's fun to try a taro-based smoothie. You'll probably drive through Hanapepe to visit Waimea Canyon (which you absolutely should do). If so, stop at Ishihara Market for more poke. 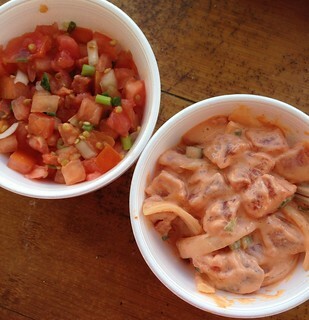 Because you can't have too much poke in Hawaii. They have a large selection of poke - more than Pono or Koloa Fish Market - kimchi snails, anyone? The seafood used is fresh. Good quality poke that you shouldn't miss if you're driving through.